The 14.0 BTDCR is a powerful 4 cylinder work horse in the Westerbeke mobile line of diesel generators. 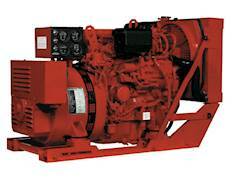 Air tuning, a cast iron block, and 1800 RPM mean increased power, longevity and smooth, quiet operation. Each 14.0 BTDCR draws on field tested design experience gained supplying generators to the United States Navy, United States Coast Guard, and all the major U.S. Fire Apparatus Builders. 116.7 amps at only 615 pounds plus full instrumentation, optional one button start remote controls and glow plugs for all weather operation make the 14.0 BTDCR ready to go when you need it. And when you need to perform scheduled preventative maintenance easy single side serviceablility makes the job a snap. The 14.0 BTDCR has the exclusive PTO to drive special options for power and rescue. Use the PTO to power high output DC alternatiors, or add an electric clutch and drive a compressor to bring air to the scene. Add the XRT Combi package to the 14.0 BTDCR and you have a combination power rescue package for all your electrical and all your rescue tool needs. The 14.0 BTDCR is a clean machine. The diesel power plant meets all EPA and CARB emission regulations and the generator produces clean stable electricity from a 4 pole backend that has simple regulation.